Last Friday at Mass, although I KNEW our Priest had said the prayers of “Consecration of the Eucharist”, as I went to receive our Lord, he became distracted by something and never said the words “The Body of Christ”. I said Amen, anyway, at the time and only over the weekend, pondered the reason why I said Amen. Did I say it because it is habit? Or did I say Amen because I TRULY believe He is present? After receiving Him, I went back to the pew and was tossed into a deep darkness where the evil one tried to tell me, it was just me that our Lord was not present for. I began to panic. I got up and went to receive our Lord in the Precious Blood, thinking maybe if I heard the words then, would be okay. As the person in front of we went to receive Him in the Precious Blood, the cup became empty and I could not receive Him. I sat back down and began to question myself. Was He there? Did I receive Him? There was a darkness I had never seen covering me in fear. It tried to trouble me more and more and Mass was over. As Mass ended I remembered I had to bring our Lord to the woman who used to run the Adoration Chapel before becoming to frail to perform her duty’s and thus it was handed over to me. Although I had our Lord with me on the trip to her home, that darkness was trying to pit my faith In Him against Him. I kept shaking my head and pondering the events as they took place, arriving at the woman’s home. I entered and just seeing her in her frail state was reminded I had a job to do. After sharing our Lord with her, I picked up her prayer book and opened it to a random page. The prayer and “pondering” were on how the evil one tries to distract us from truth, replacing Truth with confusion. After praying with her and reading out loud the chapter from her book, I told her the story of my experience that had just happened. After ward, informing her, that it did not matter if Father had not said the words “The Body of Christ”, as our Lord said it first, in the beginning. Our Lord was and Is present in the Eucharist, and always shall be. Be it that the Priest did not say it at that second, He came down at the consecration of the bread and wine, into the Body and Blood. He is there no matter how distracted we became. Many other things have taken place this weekend to try and upset my love for our Lord, but in every instance, He has been right there with consolations, filling me with His joy, no matter how my lack of faith in this instance and all was and has been tested. I was just cleaning up some dishes laying around and picked up my coffee cup from this morning. 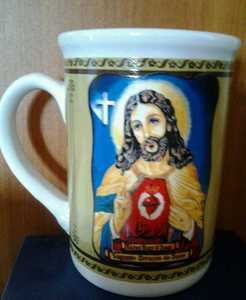 Mind you, it has the picture of the Sacred Heart of Jesus on it. As I looked into it with the little coffee left in the bottom, there was laying a dead fly. I couldn’t help but laugh. The dead fly representing Satan and his lies was dead. Killed by our Lord with just the slightest amount of liquid in the bottom of the mug. That little tiny amount of faith that I had from long ago, in our Lord, came through and grew into something much greater in the love I have for Him, because He loved us first. Although I had received Him, I needed to receive Him in word also. And we need to be reminded of that, all the time. The distraction will always be there, like clanging gongs surrounding me but faith in Him and not myself, is where it needs to be put into action EVERY second, so only His peace and Glory can resound. The consolations in this place I am in, have themselves become distraction in many ways. I do not seek them anymore although they are there. I only seek Him who grants them because I truly love Him. I need to work on this and try not distracting myself, swatting at flies.